Welcome to Day #5 of Chocolate and Cherries Theme Week. Torn Ranch (Petaluma, CA) has been producing chocolate, fruit, nut and sweet items in the Napa-Sonoma area of Northern California for 4 decades now. 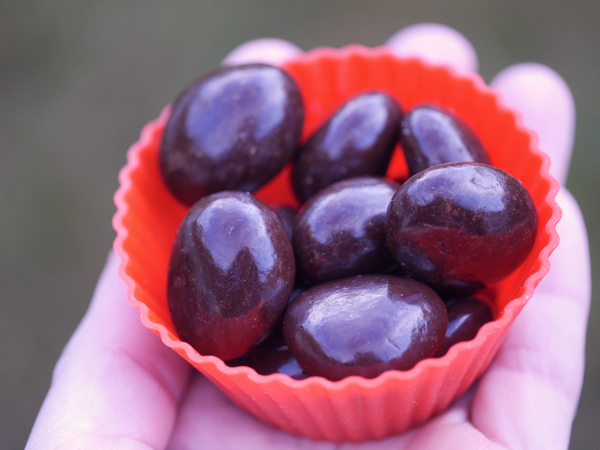 They offer several organic and gluten free items, including today's Organic Dark Chocolate Covered Cherries. People often ask me: "Aren't you running out of chocolates to try after 10 years?" The short answer: "No, I'm not. Not even close." For example, I just noticed that Torn Ranch also makes Black Cherry Dark Chocolate Cognac truffles, that could also have been included in today's cherry theme week. I "discover" new chocolates like this every week. Companies are always thinking of new chocolates. So, I'll just add those Cognac truffles to my "to try in the future" list. Back to today's dark chocolate covered cherries...The organic chocolate coating was darker (72% cacao), a bit richer, and not as sweet as some other similar offerings. (All plusses for dark chocolate lovers.) 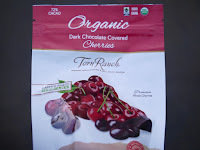 And the organic tart cherries were lightly sweetened and naturally flavorful.